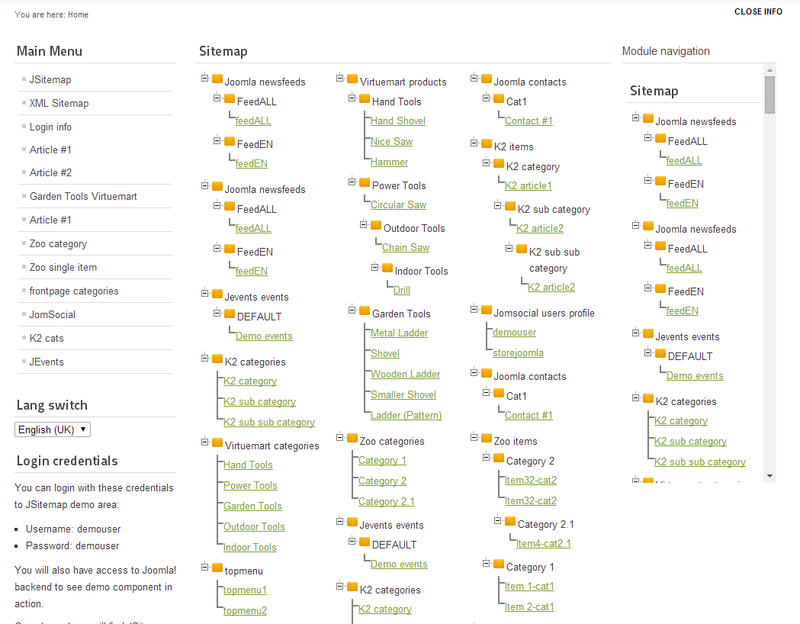 JSitemap is an award winning sitemap generator extension and a complete SEO solution for Joomla! and offers an innovative and revolutionary way to manage all types of sitemap contents without need of additional plugins! Up to 400% more site visibility! Boost your indexing with JSitemap, the advanced sitemap generator and SEO indexing tool for Joomla! Built on the shoulders of Google, now JSitemap ships with the official integration with Google Webmasters Tools and Search Console to submit, resubmit, delete sitemaps, monitor indexing status, monitor and fix crawl errors directly inside your Joomla! 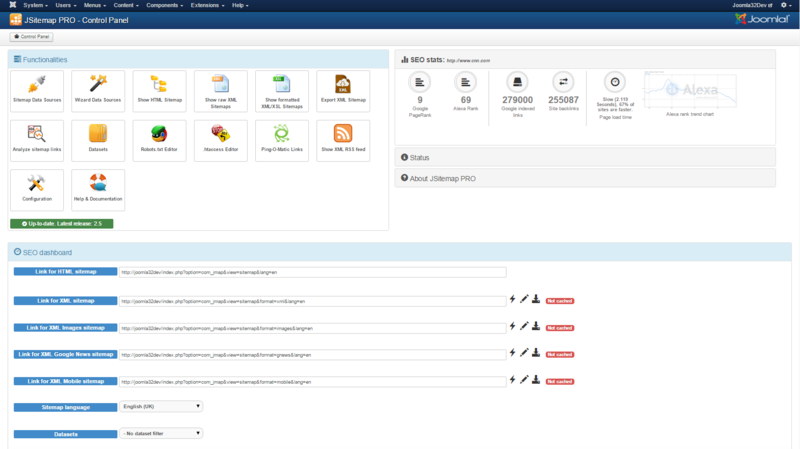 backend using a user friendly interface! Moreover the Google Search Console section lets you monitor organic searches, keywords, clicks, impressions, and the average SERP position for each page of your website. 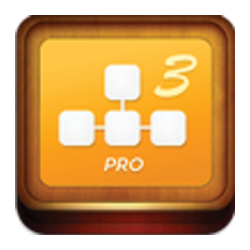 Virtuemart 2-3, Kunena 3.x and Easyblog5 compatible! You can also put into your sitemap Virtuemart products and categories! Moreover JSitemap is the only one extension that can generate a full sitemap for Kunena 3.x and supports Zoo with ZooLingual multilanguage! Google announced that on April 21, 2015 the mobile-friendly factor will affect the ranking in search results, it's important that you index your site also for mobile devices. 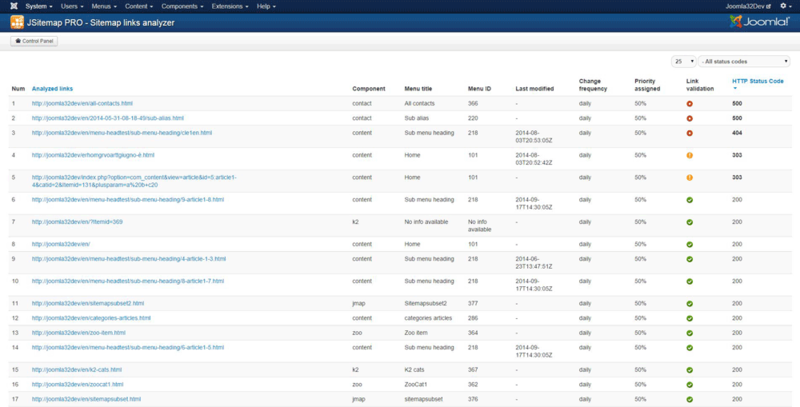 Moreover JSitemap is able to configure the Joomla! robots.txt automatically to allow access to CSS/JS resources and fix the Google warning 'Googlebot Cannot Access CSS & JS' making Google happy. JSitemap is an award winning extension and leader SEO indexing tool for Joomla!, it's a MUST for every site simply because a site that is not visible to search engines is... unuseful! You can increase the number of links indexed by Google up to 400% and gain a lot more visibility for your site! Inversion of Control Principle™ for the very first time it's reality! JSitemap for the very first time offers functionalities to realize an Inversion of Control principle for indexing your site. While till now you had to wait that search engines come to crawl your site in a passive mode, now you can reverse this route and being you that go to search engines sending information about your contents. You can do this with sitemap submit functionality available in SEO control panel, but this can be achieved even in a more powerful way thanks to the integration of Ping-O-Matic web service. 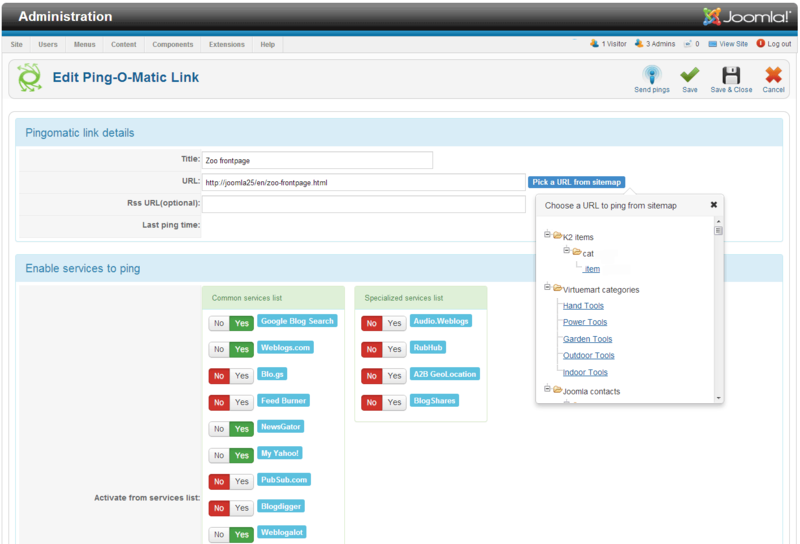 Ping-O-Matic is a web service to update different search engines that your contents has changed and need to be indexed. JSitemap is built on "Data Sources", that allow you to embed into your sitemap items taken from whatever extension with no need of additional plugins. You can create a new user defined data source with one-click wizard in few seconds and thanks to a powerful SQL Query Compiler™. With JSitemap is available a powerful and user friendly SEO control panel to accomplish all common tasks required for sitemap management and use all existing submit methods supported by search engines. Do all tasks with just one click even for non-expert administrators and avoid need to have a Webmasters Tools account! JSitemap has unique features that let you generate different types of sitemap to gain top level SEO performance for your site. It works on every environment supporting fine tuning for server load resources and caching system during generation of sitemaps. It's also capable to generate RSS feeds for your contents and for a lot of common Joomla extensions such as EasyBlog, Virtuemart, Kunena, K2, Docman and more. As always just one click to add a data source and include elements in the RSS feeds, and for not included common extensions a custom data source can be used to generate RSS feeds covering 99% of cases. Using datasets to manage multiple sitemaps it's possible differentiate the elements included in the sitemap from that included in the RSS feeds, with a single extension now you can satisfy both needs. 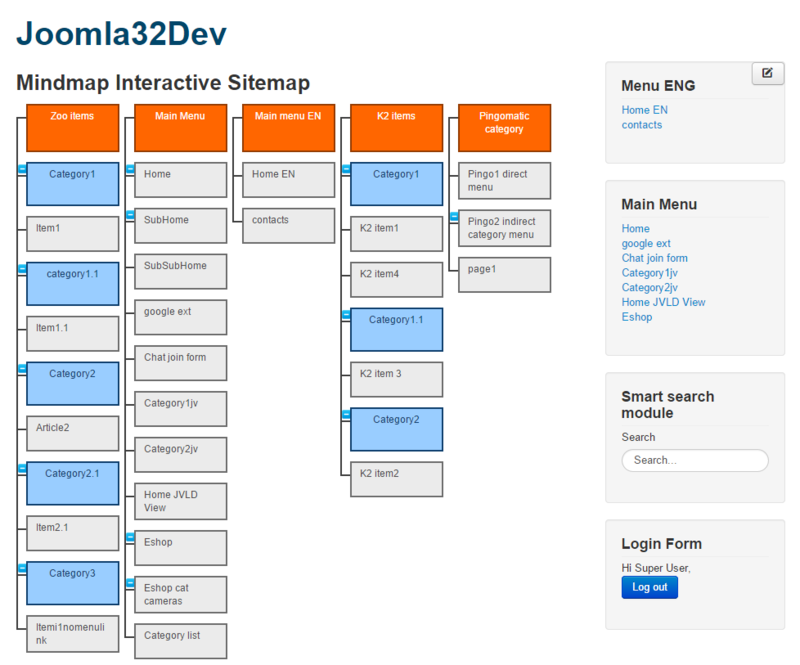 Take advantage of advanced sitemap formats such as the Geo sitemap. It's particularly useful for search engines to identify the exact location of your business or website and to serve most pertinent search results to users based on their location and origin. The Hreflang sitemap is the most powerful multilanguage sitemap that you can submit to search engines, instructing how your links are associated and related for all installed languages . Let's go, take control of your contents! Using the Search Engines Metainfo Dashboard™ now you can finally instruct Google and search engines about the exact title and description that you want to be showed in search results for each page of your site contained in the sitemap! You can also control in a breeze which links should not be indexed by search engines. Moreover the title, description and image specified will work even for socials when your pages are shared because it uses the Open Graph protocol. The new Google Indexing Tester™ lets you monitor exactly how your site is being indexed in Google SERP, to find out which links, titles and descriptions are indexed. Using this tool you can also perform searches for specific keywords, varying language and country. In this way you can understand how your site is positioned on Google in different countries or languages all around the world! The Google Indexing tester™ is an extreme powerful tool and it integrates with the official Google API for search results, offering you exact results directly in your Joomla! backend. How to get point ? Hi I have already paid 5 points for this components and others. Where are my download? I can't update. I paid for many download. Could you please fix this bug? Hi, you can get updates from my downloads menu. we also buy extensions subscription from users now and give them points. (based on price and remained time). you can buy silver plan (just 10 €) and get updates + 2 new downloads. I still don't understand some things. Last year I bought a total of 13 extensions with you. I paid to download the extensions and also their updates. Now, if I do not pay for a subscription, I can not download them. I would like to know one thing. If I pay for the Silver subscription, can I only download two extensions or two downloads or one extension and one download? And that, only for one month? Does that mean that every time I want a new update, I'll have to pay € 10? Because normally there are no two updates of the same extension in the same month. So if I add all the updates of a year, it is very likely that I will end up paying you the same money that the extension costs or more. On the other hand, perhaps if a person needs 30, 50 or 100 extensions it may be good for him to buy a Gold subscription, but many people only need 5, 7, 9 extensions. I would like to understand why I can not continue downloading, at least, the extensions that I paid for at the time. I understand that if I want new ones, I have to pay them. The thing changes if you tell me that, if I pay a Silver subscription, all the extensions that I had bought (a total of 13) appear again in my Area Client, and I can download all the updates. Hi, yes, with any subscription you will have access to updates of all your previous downloads + new downloads. Ok. Thanks a lot for your response. In that case, it seems good to me how you did it. If we can download the updates it's really fine. That part was important. i cant download , why?